Generator set manufacturer Himoinsa, operating in the U.S. as Hipower Systems, recently announced it has signed a consolidated operation agreement with Japanese firm Yanmar, a leading producer of diesel engines for agricultural, marine and construction equipment. The arrangement will strengthen the market positions of Himoinsa and Yanmar and enable Himoinsa to add generator engines to its product line. Himoinsa’s long-standing goal has been to operate as a vertical manufacturer, offering a product that features 100 percent Himoinsa quality. In this pursuit over more than 30 years of history, the company has oriented its business strategy to engineer and manufacture all the components required for a generator set. The company already produces its own alternators, electric controllers, canopies and other components, and with this business alliance, Himoinsa adds engines to its business line. 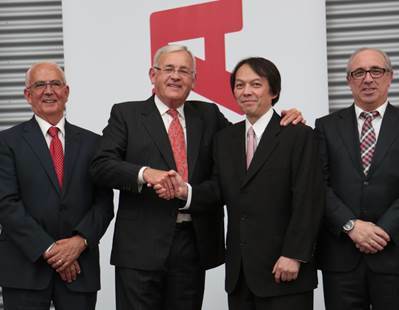 With the new structure, Yanmar will acquire a 70 percent stake in Himoinsa. No changes to company names, branding or employee structuring will occur at either firm as a result of the arrangement. For more info on Himoinsa, visit its website right over here.